8.27am: There has been a 2nd explosion on the underground, this time close to Oxford Circus. Both explosions appear to have occurred on the trains as they were moving. 8.40am: Reports are coming in that a third explosion has now occurred on an underground train approaching Vauxhall station. 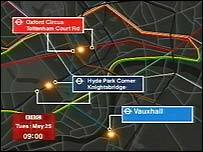 9am: News 24 headlines: In the past hour there have been three major explosions on the London Underground. The first at 8.10am on the Piccadilly Line between Knightsbridge and Hyde Park Corner. The second at 8.16 on the Central Line between Tottenham Court Road and Oxford Circus and the third at 8.27 as a train was arriving at Vauxhall station in Stockwell on the Victoria line. Emergency services have been called to all three scenes. There are no reports on number of casualties and the police say its too early to identify a possible cause. London underground is now closed and police are now urging people not to travel. 10.10: We're just getting reports that there has been a further explosion in central London in the region around Liverpool street station, we will of course bring you more news on that as soon as we can. Meanwhile traffic problems continue in central London as the full effects of the emergency police cordons are being felt. 10.41: We can now confirm that a tanker carrying chlorine has exploded at the junction of Shoreditch high Street and commercial street. Chlorine is extremely toxic in this form and police are issuing express warnings for people to stay indoors, close windows and remain there until the all clear is given. 10.44: Police are still urging people to stay indoors until the extent of the chlorine release is known. 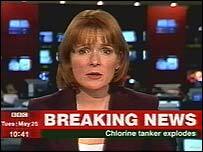 They are repeating again, chlorine is extremely toxic. 10.48: First reports from the Commercial Street area suggest many casualties. One eyewitness has described a fog of greenish gas on the surrounding streets. Police are urging people to stay indoors until the extent of the chlorine release is known. 11.23: Clearly, a very serious situation is emerging in Commercial Street. I am now able to bring you an update from Hyde Park, where 19 people have been confirmed dead. 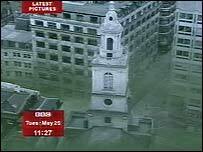 First pictures from the chlorine gas cloud in Panorama's "London under attack"
11.27: The chlorine is concentrated in the Bishopsgate area at the moment and we've just been sent these pictures from the scene. That is the gas, it tends to swirl and then sink to ground level. It actually looks like a liquid but that is in fact gas and it is highly toxic. 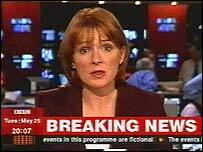 One o' Clock news: London has come under attack this morning. Three explosions on the underground have been followed by a chemical tanker which exploded, releasing lethal chlorine gas. Police are continuing to encourage the public to stay indoors. 40 people are now confirmed dead and there are many hundreds injured. 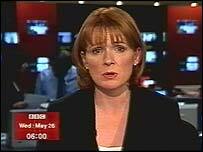 The Home Secretary says the attacks bear the hallmarks of al-Qaeda but there is no confirmation of their involvement. The emergency services are attending all the scenes but it is clear they are severely stretched. 19:22: Downing Street says messages of support and condolence have been coming in from across the world. They include the President of the United States, the President of France and the UN secretary general. 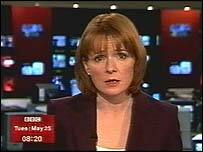 The Prime Minister is due to address the nation at 9 o'clock tonight. 87 people have been confirmed dead and hundreds have been injured. The search and rescue mission will continue through the night. We understand that a further 94 people are confirmed dead from the Oxford Circus and Vauxhall explosions. 20.07: News is just reaching that following a full scale alert, the police have intercepted a 2nd chemical tanker on the A13 near Basildon. It has been reported that this tanker was carrying cyanide. There have been no injuries. No further details have yet been released. 20.17: The police have issued up to date figures for the dead and injured. As of now we have 370 declared dead as a result of the three underground explosions and 2,100 dead from the chlorine tanker explosion. Several hundred people have been taken to hospital but none of the trains as yet have been completely evacuated. 06.00 Wednesday, 26 May:London is waking this morning after the worst terrorist attack in its history. According to official figures, more than 3,000 people may have died, with at least a further 3,000 injured. The Queen has expressed her deep sorrow and the Prime Minister has pledged to bring the perpetrators to justice.